In an age where smart technologies abound you’d think that enabling smart conference room technology would be a standard in most offices. Unfortunately, many workplaces are still plagued with hardware and compatibility issues creating strategic roadblocks to effective collaboration. Finding the right technology solution to reduce connectivity friction is a critical component and there are competing technologies out there. Chromecast has become a popular consumer solution in recent years. However, its reliability on a Wi-Fi connection leads to network slowdowns. Miracast provides a point-to-point connection between device and display so a Wi-Fi network is not required, thereby eliminating device to display delays and network slow-downs. Today we’ll discuss what Miracast is, how it operates, and beneficial applications for workplaces. Miracast allows you to display what’s on your device on a larger screen. For example, let’s say you want to give a presentation with images and audio in a conference room. Instead of finding the necessary cables and attaching your laptop to the display, you can use it to wirelessly mirror your screen to the room display. Miracast has been recognized by the Wi-Fi Alliance as the industry standard for wireless display technology for nearly five years, and continues to evolve. For example, it now supports HD and 4K content. Different from a standard wireless network that covers a whole home, office, or building, the connection is simply one device communicating directly with another. Miracast has been described as a wireless HDMI cable connection without the cable. Enhanced functionality can be gained by using ScreenBeam Wireless Display technology, allowing users to fully interact with each other and the displayed content. Miracast comes enabled on a variety of wireless devices. You can see a complete list of Wi-Fi Alliance’s Wi-Fi CERTIFIED devices that work with Miracast here. It’s native with modern Windows devices including Windows 10. It’s also supported in Android 4.2 and Android 5 devices. Other devices may be able to use with a simple adapter. Based on a Wi-Fi Direct standard, Miracast allows a peer-to-peer wireless connection, which is established using Wireless Protected Setup (WPS). The connection is a Wi-Fi connection, but the fact that it’s direct means it doesn’t require an existing network. Miracast devices can communicate directly with each other, allowing the content from one device to be displayed on the other. We’ve all been there. You’re about to give an important presentation and everyone’s looking at you. They all want to hear what you have to say, but nobody has time to waste. Then you realize that the cable you brought to connect your laptop to the meeting room’s display doesn’t fit. You scramble to find the right cable, but your audience is losing focus. With Miracast, users don’t waste time looking for the right cable. They seamlessly connect devices to displays, and switch from one presenter to another, increasing productivity while cutting setup time. This eliminates time lags that cut into the first few minutes of your meetings because of compatibility issues. Miracast doesn’t require Wi-Fi to establish a connection. You don’t have to worry about network slow-downs, even when displaying video, and your IT department doesn’t have to worry about any extra strain on the network. Moving around the room is a must with today’s presentations. Professional speakers and teachers frequently move around for several reasons. First, it feels more natural to walk around than to stand tethered to a computer or podium. Second, the movement helps hold the audience’s attention and helps them remember more of the information later. Third, a speaker who moves about seems more like they’re engaging with the audience than lecturing, building a rapport and fostering interaction. With wireless mirroring, presenters aren’t tied down by cables. They can now move as they desire. Important sales pitches, strategy sessions, and more take on new life when speakers are free to move naturally and interact with their colleagues. Increasingly, companies are removing whiteboards from their conference rooms and installing interactive touch displays. These displays are great for collaboration. Many teams take things a step further by using ScreenBeam’s screen-mirroring technology, which allows Miracast devices to fully interact with touch displays. 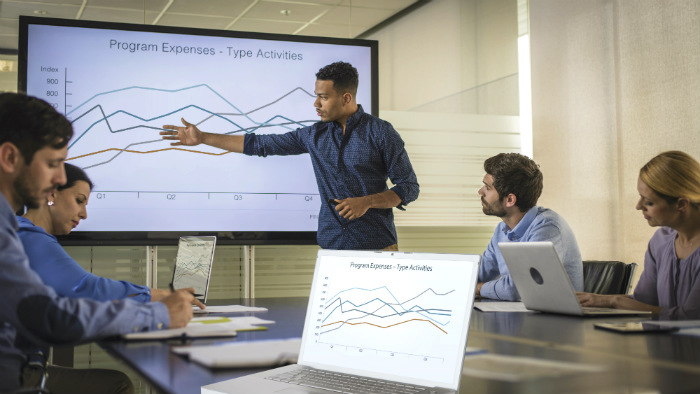 Miracast helps presenters replace the tired one-to-many lecture with interactive discussions, inspiring everyone to contribute their thoughts and ideas. Users can share notes, images, and annotations easily, and everyone can have a copy right away. When the team is constantly connected, they can strike an optimal workflow much more easily. One of the first questions businesses ask when they consider adopting a new technology is how much it will cost to upgrade their systems. The beauty of Miracast is that it’s native to Windows 10 and 8.1. With 500 million active machines currently running Windows 10, there are a ton of devices already compatible with this technology. Because Miracast doesn’t have to rely on a wireless network to display content, users can rest assured that sensitive material is kept secure. This focus on safeguarding information makes ScreenBeam the ideal wireless display solution for industries with stringent security standards from large-scale financial institutions to small medical offices. Using Miracast with Windows devices comes with a huge bonus: With collaborative tools like OneNote and Windows Ink, the productivity of working sessions is elevated. Now, sharing is so much more than emailing the PowerPoint presentation to everyone after the meeting. Team members can share screenshots, annotations, and data instantly and wirelessly. The benefits of working together with the aid of Miracast and ScreenBeam Wireless Display technology mean a lot in today’s fast-paced business environment. When they don’t have to find cords, get everyone on the Wi-Fi, or hand out paper notes, your team can spend more time doing what they do best. When they can move around the room to maximize collaboration and engagement, your team can be more productive. This technology is a simple way to transform your conference room into a place where great things happen. Do you know how much late meeting starts can cost your business in terms of lost productivity? Calculate your wireless display ROI by using this quick online tool or if you’re attending Ignite this week, stop by our booth #2255 for a demo.